The Penguin Monarchs series is a comprehensive, informative and highly readable overview of one thousand years of monarchy, written by experts. Every sovereign gets their own short book (including Oliver Cromwell) packed full of everything you need to know about their life and reign. They're the perfect introduction to all the rulers from Athelstan to Elizabeth II and twenty are now available in paperback. Below, Designer Matthew Young tells us about the design process that led to the final distinctive look of this paperback series. Forty-five books, fourty-four monarchs, and one enormous family tree. 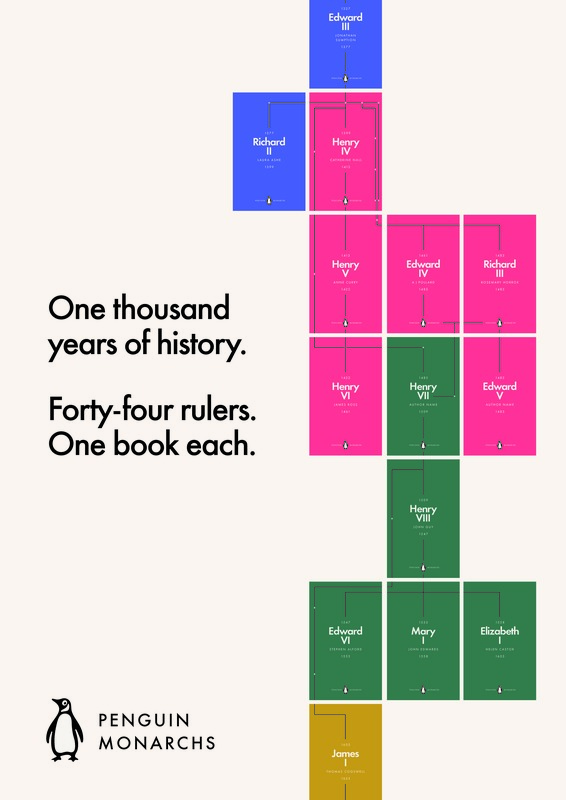 Penguin Monarchs is an ambitious series of books: biographies of every English monarch from Athelstan (crowned in 924) all the way up to Elizabeth II (1952), charting the shifting balance of power as different dynasties rose and fell from prominence. Originally published as smart hardbacks with brilliant and varied illustrated jackets, the brief for the paperback editions was to do something different, to reach a different audience of readers. I stressed early on that setting the right price for the books was crucial: they need to be accessible and affordable, and we settled on £4.99 as our RRP. However, this presented an interesting challenge: in order to keep the books profitable, we had no money in the budget to spend on design, illustration or photography. With this in mind, I began searching for iconography that could apply to all monarchs, and was available in the public domain — free to use. An early idea involved signatures. We have signatures or marks of some sort for every monarch — they feature on the hardbacks, and on the title pages of the books — but I felt they weren’t captivating enough to splash across forty-five different covers. Crests and badges were an attractive alternative: every monarch has a coat of arms (or so I thought) and other personal insignia, and I felt this could make for a very collectible series of book covers. Wikipedia provided a rich source of heraldic history, but royals didn’t start using coats of arms until medieval times, and for many of the earliest monarchs it proved difficult or impossible to find any reliable iconography. A bigger hurdle was the fact that modern coats of arms are not in the public domain, and have strict rules about how and where they can be reproduced: if you’re not the queen or a government department, you’re not allowed. One thing I particularly liked on these covers was the inclusion of the dates indicating the start and end of each monarch’s reign. Dates would feature on the spines too, so that when lined up the spines form a timeline showing when each monarch took over from their predecessor. This idea of a timeline on the spines got me wondering if the idea could extend to the front covers as well, using them to build up a whole family tree. I loved the idea of showing the connections between different factions of the same family as they struggled for control of the throne. After lots of research, it turns out every monarch is connected — even foreign invaders such as a William the Conqueror had children who married into the lineage of English monarchs to bolster their claim to the throne. The one interruption is Oliver Cromwell, who ruled the country for an eleven year period when England didn’t have a monarchy, following a Civil War and the removal of Charles I — the only English monarch ever to be tried and executed. Sometimes the connection is straight forward — Edward I was succeeded by Edward II, who was succeeded by Edward III. But the line of ascension is rarely straight for long — when a king or queen has died with no surviving heir the monarchy passes to a distant relation, or multiple claims arise and a bloody struggle ensues (the houses of York and Lancaster get particularly messy as the throne swung back and forth between rival houses) — so it took a lot of trial and error to find a way to successfully connect all the covers. A lot of the crucial connections involve princes, dukes, wives and other relations who never sat on the throne, but provide a crucial link between those who did. The solution was to include these relations on the covers, but as minor points the map, with the monarchs themselves as the focal point. Typography is kept deliberately simple and modern — these are not traditional fusty history books — and the colour indicates the house that the monarch belongs to: green for Tudor, yellow for Stuart, and so on. Twenty of the Penguin Monarchs are out now in paperback, with the rest to publish in the months and years ahead. When the series is complete you’ll be able to lay the covers side by side to build up the full family tree, measuring 5 metres from top to bottom.